Ask fellow campers about "Chesapeake Campground" and nearby attractions. Upon check-in, the staff was most pleasant and gave us a good insight to the rules and regs of the campground. We drove to our assigned camp site and found that everything was not as "nice" as the web site depicts. We found that there was a lot of mud, and mulch debris all over the site. Didn't pay much attention to it at the time, but every time we went into our camper, we dragged this mulch stuff in and it got all over our sheets. We had to constantly sweep out our camper. We were told that all we had to do to re-enter the park was to drive up to the gate, enter our code and drive in when the gate goes up. We left for a bit on Saturday the 28th. When we returned, there was a "gate guard" sitting in a golf cart at the gate. As we slowly drove by, she asked "Can I help you?". I replied "NO THANK YOU" and attempted to get up to the key code unit. She yelled at me to "GET BACK HERE". When I backed up to see what she wanted, she commenced to give me the "3rd Degree" about who we were, were we camping there, etc. She wasn't even nice about it. When I showed her our pass, she opened the gate - I DID NOT NEED HER HELP TO OPEN THE GATE!!! The Restrooms appeared to be neat and clean. However, in the men's side, of six (6) stalls, only two (2) had toilet paper and one of these unit was plugged up with a big nasty looking mess. Went to take a shower and found the privacy door kind of falling off the hinges, to which I had to lift it up to close it. The women's side didn't fare much better. The shower stalls do not have space to leave you dry clothes, or dress without getting wet. Kind of defeats the purpose of taking a shower and putting on dry clothes. Lastly, the rain came. Our site flooded to the point we had no other option but to pack up and leave. Both my wife and I were absolutely soaked by the time we got the camper loaded and on our way. Chesapeake Campground DOES NOT GIVE REFUNDS. We WILL NOT visit this camp site again. We camped at Chesapeake Campground in a Travel Trailer. Go shopping and/or use entertainment off-site. The facilities at the campground are not maintained very well. We ended up leaving within an hour of our arrival. We set up in a very unleval space that seemed to be crawling with every type of bug including yellow flys and hornets. We could have possibly overlooked that, except the 30 amp breaker could not handle running our 1 air conditioner. We called to see if they could move us to another spot or fix the breaker and they told us they didn't have any other spot to move us to. Since it was a 90 degree day, I asked for our money back since they couldn't accommodate us. They refused to refund my money because the last person in that site had no problem so the problem was mine. We left, found another rv campground and had no problems there, which proves their breaker was defective like I thought. Overall the park seemed to be run down and it looked like the sites had seen better days. The positive is that there was not a lot of road noise. We camped at Chesapeake Campground in a Fifth Wheel. Once inside the campground you must navigate narrow roads and tight turns to make it all the way to the back for the "pull-through" site area by "Tent Town". Paved sites are very nice, but hope it doesn't rain since the surrounding grass and mud in our case was 2"-3" lower than parking pad and filled with water quickly. The drive back takes you through a storage area that reminds one of a salvage yard. In the rules you are told they are inspected by the "health inspector" every 3 weeks so campsites should not appear to be permanent residents. This is basically ignored, plus children can be seen walking back from being dropped off by school buses. The approach from the north on US17 Business requires a tight left turn across a drawbridge then a quick left on the narrow road the campground is located on. The good, close to Norfolk and surrounding area. We camped at Chesapeake Campground in a Motorhome. The long and short of it is only camp here if you want to canoe or bike around the Great Dismal Swamp. Our takeaway was that the Swamp should be renamed to "The Really Not so Bad Swamp" and this park should inherit the "Great Dismal" name. Starting at making the reservation it took 20 minutes on the phone. Then at check-in, we waited another 1/2 hour. Then the entrance gate doesn't go all the way vertical so I had to negotiate it so that didn't hit it with the trailer. To get to the campsite you drive way back including a nice tour of a RV storage yard that looks like a RV graveyard (but hey - you can inquire about buying abandoned RV's). The site had low-hanging trees that brushed our rig as we pulled in. The site is paved but so narrowly it's hard to get your rig entirely on the pavement. I plugged in our electric only to have the box spark and electric go dead (glad I had a regulator/surge suppressor in line already). They sent a tech who grabbed MY 30A to 50A adapter AND $300 surge suppressor to test with, only to receive a bigger spark and no power. We called to try and get a new site while he worked on the power pole but they couldn't move us fast enough and he got it working (again grabbing my gear without asking to do a final test with). The bathrooms are marginal, showers look more recent but not well-cleaned. Showering was an exercise in tolerating being scalded and frozen along with a 95db ceiling fan in your ear. No paper towels or hand dryers in the bathroom. Lots of seasonal residents with ill-kept places, but that suits the park as everything the park owns is ill-kept as well. 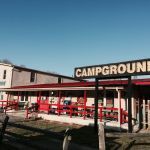 With driving range, horses, train room, exercise room, rental bikes, rental canoes, sports courts, tractor displays...the RV park is simply trying to do too much and failing at all of it. It all needs maintenance. It's all run-down. The only upside to our stay here was that we met a really great family camped next to us and met nice people in the laundry room. Otherwise it was hard to see anything in the park that wasn't in some state of disrepair. We camped at Chesapeake Campground in a Fifth Wheel. This is a nice wooded park. The parking pads are adequate but in need of updating. Sewer hookups are for their permanent residents but the pump out is free and easily accessible. They will come to your site to pump out for $6. It is safe and all permanent campsites are well maintained. It is true that part of it looks like a trailer park, and the very back part has some very long term residents, but it is located near the dismal swamp trail and the staff is friendly. Pool closes at 8-- a little early for hot summer nights. Good Sam discount available. We camped at Chesapeake Campground in a Motorhome. I have stayed here for about a year (military duties). The location is nice due to being out if town but shopping and most places I needed were within 20 minute drive. The campground itself is definitely older. There are many things to do such as a driving range, swimming pools, horses, and most other things you would like to find at a campground. The place is a little run down and a lot of permanent residence which makes some areas feel more like a trailer park than a campground. All of the sewer hookups are taken by some of the really long time "campers". This required me to use a portable to dump my tanks or you can use their honey-wagon service ($6 for two tanks) to have your tanks pumped out. I stayed here out of necessity and would only stay in the future again out of necessity. We camped at Chesapeake Campground in a Travel Trailer. What a dump! Campground is filled with old run down trailers surrounded by trash and broken down vehicles. Most sites are full time residents, some with fences, decks and patio covers. Only 5 or 6 sites for transients that are very narrow. Bath house is filthy and smells; laundry has old rusty washers and dryers. Would never stay here again. We camped at Chesapeake Campground in a Fifth Wheel. Lots of full timers but still felt comfortable. Security guard on site 24/7. Trailer storage in front. Was okay. We camped at Chesapeake Campground in a Fifth Wheel. We stayed here three different times during June and July. Although the campground personnel were helpful, the RV park was basically a full time trailer park. Dogs barking were a problem, although when we complained, the individual complaint was promptly attended to. However, we complained about the dirty bathrooms and shower rooms on three different occasions and nothing was done. In addition the exercise building was extremely dirty and in poor condition. The VA side of the Dismal Swamp was very close by and we enjoyed boating on the canal and biking on the canal bike trail. We camped at Chesapeake Campground in a Fifth Wheel. We are a military family from Florida. We were stationed in Norfolk, Va. for 18 months. It turned into a 3 and 1/2 year stay. Surprise, surprise, lol. We decided to pull the travel trailer up and stay in it for the 18 months, ha-ha, I mean 3 plus years. Anyway, we waited a few weeks to get a permanent site at Chesapeake Campground. We had children with us that attended school and were able to enroll them in school living there. They have bus pick-up in front of the campground. I wasn't really sure how everything would go for the first couple of months, it was a little cramped at first. I will also tell you my husband is not too swell on camping. Can you believe I talked him into this endeavor. We made that place home in no time at all. My son learned to swim in their saltwater pool. We had to go everyday so needless to say, I got to keep my Florida tan. The campground is an older park, but well maintained we felt. We always felt very safe there, even when my husband was gone on deployments. The staff was great!!!! Keep up the great work. There garden was the best in the summer and very cheap. Loved hitting golfballs at the driving range or walking up to get a ice cream cone in the evenings. We made some great, great friends there and truly learned to camp. You never had to look far for help if something broke. My husband actually started enjoying campfires and now refers to himself as Campfire Lou. We truly miss the campground, the lifestyle, and all the good friends we made in Virginia:) We camped at Chesapeake Campground in a Travel Trailer. The campground has a fairly large number of apparently permanent residents. Most of the choice shaded sites appeared to be occupied by the permanent residents as evidenced by storage sheds, patios, porches and permanently mounted satellite antennae. Sites for transients were roomy drive-through asphalt pads, all appeared to be limited to electric and water only in an open grassy field. The roads to sites, although mostly one lane wide, were adequate to maneuver large rigs. The campground was quiet with stable 30/50 amp electric and water hook-ups. The sites were well away from the highway and located behind a large area dedicated to RV storage. We camped at Chesapeake Campground in a Motorhome. This is an older campground, and there are a lot of permanent campers here which makes some areas look really trashy. The camping area sits back a long way from the office and entry area. The road leading to the camping area is only wide enough for one car and exit areas off of the sites are not wide enough to pull out without driving through the grass/mud. I do not consider this facility to be "big rig friendly" based on this. Our site was very muddy, and there is very poor drainage so a lot of standing water around the rigs. They advertise pony rides, but that must only be a summer thing as they weren't available when we were there. If you are thinking of staying there, check out the site ahead of time as there are no refunds if you don't like your site. We would not stay there again. We camped at Chesapeake Campground in a Fifth Wheel. The restrooms were clean but there were no towels or air dryer. The shower had the same black hair in it every day I used it, so apparently it had been overlooked during cleaning. Most of the sites are filled with "permanent" residents, and many are cluttered and not well kept, some with very old run down trailers. The person who checked us in was friendly. The park is located at a farm where riding lessons and events are held and could be great entertainment for kids. We camped at Chesapeake Campground in a Fifth Wheel. The campground itself is nice. It has stables and you can do pony rides for your kids. They have chickens, and you can buy fresh brown eggs for breakfast. There are volleyball courts and a small putt-putt golf course. There are bicycle, golf cart and canoe / rowboat rentals. Prices seemed good. They are right across from a canal that is part of the Intracoastal: so you can paddle for a ways if you wish. We brought our tent up, and just used a tent spot. The spots were nice enough. However the bathrooms were old and in need of serious cleaning. The showers had plenty of hot water, but just didn't seem "nice". Not clean. I used the showers, just would prefer something cleaner. Quite time is 10:00PM. There was a large group two tent sites behind our site. There were a lot of people and vehicles: they did not stick to the limit of people or cars. The place has a big sign saying they are a family-oriented campground, and beer and pot parties are not allowed. There was a lot of glass bottle clinking going on. Singing until around midnight. Loud talk with a lot of bad language thrown in, lasted until a quarter-to-one in the morning. A very loud start to an off-color, racist joke, that thankfully one of the group members put a stop to. The security truck went around a little past 10PM. I did not see him back after that at all. Just one round. I complained when checking out, and found other campers had complained as well. The checkout person said we should call security when that is going on. As an aside, I did consider calling security and wandered by their camper a little past midnight, but felt it unfair to call or knock on a door that late. So: I'm not entirely sure we would go back again. I know my youngest son would enjoy the putt-putt and horses and volleyball (we'd snag a sand court and play badminton). He would not go anywhere near the restrooms or the showers while we were there. I would not want to have to deal with noisy campers, inappropriate language, off-color jokes or beer parties. And I feel security should make more than one round and should go by all the camping spots (he did not drive by that section). I think I'd give this one a miss next time. They certainly try to be a family campground, and if it was a little cleaner I'd try again and just call if things seemed out of hand. I know my youngest son would love it, I just don't want to have to deal with noisy campers and off-color language at a quarter to one. We camped at Chesapeake Campground in a Tent. This Campground is a bit scary. They have a lot of permanent campers and they stare at you if you happen to walk past. We stayed on the other side of camp on and off for two weeks. It was okay for a bit but we most likely will not go back. Too many creepy people. We camped at Chesapeake Campground in a Travel Trailer. Are you affiliated with Chesapeake Campground ?